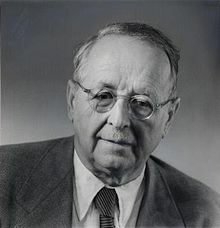 Hermann Weyl (9 November 1885 – 8 December 1955) was a German mathematician, theoretical physicist and philosopher.. It seems clear that [set theory] violates against the essence of the continuum, which, by its very nature, cannot at all be battered into a single set of elements. Not the relationship of an element to a set, but of a part to a whole ought to be taken as a basis for the analysis of a continuum. Cartan developed a general scheme of infinitesimal geometry in which Klein's notions were applied to the tangent plane and not to the n-dimensional manifold M itself. In these days the angel of topology and the devil of abstract algebra fight for the soul of each individual mathematical domain. Weyl, Hermann. Invariants. Duke Math. J. 5 (1939), no. 3, 489--502. doi:10.1215/S0012-7094-39-00540-5. http://projecteuclid.org/euclid.dmj/1077491405. We now come to a decisive step of mathematical abstraction: we forget about what the symbols stand for... [The mathematician] need not be idle; there are many operations which he may carry out with these symbols, without ever having to look at the things they stand for. [Physicists and philosophers] stick stubbornly to the principles of a mechanistic interpretation of the world after physics has, in its factual structure, already outgrown the latter. They have the same excuse as the inhabitant of the mainland who for the first time travels on the open sea: he will desperately try to stay in sight of the vanishing coast line, as long as there is no other coast in sight, towards which he steers. This letter, if judged by the novelty and profundity of ideas it contains, is perhaps the most substantial piece of writing in the whole literature of mankind. It was my wish to present this great subject as an illustration of the itermingling of philosophical, mathematical, and physical thought, a study which is dear to my heart. This could be done only by building up the theory systematically from the foundations, and by restricting attention throughout to the principles. But I have not been able to satisfy these self-imposed requirements: the mathematician predominates at the expense of the philosopher. To gaze up from the ruins of the oppressive present towards the stars is to recognise the indestructible world of laws, to strengthen faith in reason, to realise the "harmonia mundi" that transfuses all phenomena, and that never has been, nor will be, disturbed. A new theory by the author has been added, which draws the physical inferences consequent on the extension of the foundations of geometry beyond Reimann... and represents an attempt to derive from world-geometry not only gravitational but also electromagnetic phenomena. Even if this theory is still only in its infant stage, I feel convinced that it contains no less truth than Einstein's Theory of Gravitation—whether this amount of truth is unlimited or, what is more probable, is bounded by the Quantum Theory. Space and time are commonly regarded as the forms of existence of the real world, matter as its substance. A definite portion of matter occupies a definite part of space at a definite moment of time. It is in the composite idea of motion that these three fundamental conceptions enter into intimate relationship. The Greeks made Space the subject-matter of a science of supreme simplicity and certainty. and certainty Out of it grew, in the mind of classical antiquity, the idea of pure science. Geometry became one of the most powerful expressions of that sovereignty of the intellect that inspired the thought of those times. At a later epoch, when the intellectual despotism of the Church... had crumbled, and a wave of scepticism threatened to sweep away all that had seemed most fixed, those who believed in Truth clung to Geometry as to a rock, and it was the highest ideal of every scientist to carry on his science "more geometrico". Matter... could be measured as a quantity and... its characteristic expression as a substance was the Law of Conservation of Matter... This, which has hitherto represented our knowledge of space and matter, and which was in many quarters claimed by philosophers as a priori knowledge, absolutely general and necessary, stands to-day a tottering structure. First, the physicists in the persons of Faraday and Maxwell, proposed the "electromagnetic field" in contradistinction to matter, as a reality of a different category. Then, during the last century, the mathematicians, … secretly undermined belief in the evidence of Euclidean Geometry. And now, in our time, there has been unloosed a cataclysm which has swept away space, time, and matter hitherto regarded as the firmest pillars of natural science, but only to make place for a view of things of wider scope and entailing a deeper vision. This revolution was promoted essentially by the thought of one man, Albert Einstein. The rapid development of science... has, as it were, burst its old shell, now become too narrow. Recognition of the subjectivity of the qualities of sense is found in Galilei (and also in Descartes and Hobbes) in a form closely related to the principle underlying the constructive mathematical method of our modern physics which repudiates" qualities". In the field of philosophy Kant was the first to take the next decisive step towards the point of view that not only the qualities revealed by the senses, but also space and spatial characteristics have no objective significance in the absolute sense; in other words, that space, too, is only a form of our perception. In the realm of physics it is perhaps only the theory of relativity which has made it quite clear that the two essences, space and time, entering into our intuition, have no place in the world constructed by mathematical physics. Colours are thus "really" not even æther-vibrations, but merely a series of values of mathematical functions in which occur four independent parameters corresponding to the three dimensions of space, and the one of time. It is the nature of a real thing to be inexhaustible in content; we can get an ever deeper insight into this content by the continual addition of new experiences, partly in apparent contradiction, by bringing them into harmony with one another. In this interpretation, things of the real world are approximate ideas. From this arises the empirical character of all our knowledge of reality. Time is the primitive form of the stream of consciousness. ...If we project ourselves outside the stream of consciousness and represent its content as an object, it becomes an event happening in time, the separate stages of which stand to one another in the relations of earlier and later. All characteristics of material things as they are presented to us in the acts of external perception (e.g. colour) are endowed with the separateness of spatial extension, but it is only when we build up a single connected real world out of all our experiences that the spatial extension, which is a constituent of every perception, becomes a part of one and the same all-inclusive space. … every material thing can, without changing content, equally well occupy a position in Space different from its present one. This immediately gives us the property of the homogeneity of space which is the root of the conception, Congruence. Consciousness spreads out its web, in the form of time, over reality. Ch. 2 "The Metrical Continuum"
Above all, the ominous clouds of those phenomena that we are with varying success seeking to explain by means of the quantum of action, are throwing their shadows over the sphere of physical knowledge, threatening no one knows what new revolution. Ch. 3 "Relativity of Space and Time"
The scene of action of reality is not a three-dimensional Euclidean space but rather a four-dimensional world, in which space and time are linked together indissolubly. However deep the chasm may be that separates the intuitive nature of space from that of time in our experience, nothing of this qualitative difference enters into the objective world which physics endeavors to crystallize out of direct experience. It is a four-dimensional continuum, which is neither "time" nor "space". Only the consciousness that passes on in one portion of this world experiences the detached piece which comes to meet it and passes behind it as history, that is, as a process that is going forward in time and takes place in space. Hermann Weyl’s 1918 text Das Kontinuum... investigates how much of the mathematical corpus can be retained if we restrict ourselves to predicative definitions and methods of proof. He presents a foundational system in which it is impossible to perform an impredicative definition. ...It is an excellent example of a fully developed non-mainstream foundational system for mathematics. In the first attempt to introduce gauge theories in physics, Hermann Weyl, around the 1920s, proposed certain scale transformations to be a fundamental symmetry of nature. Weyl considered an aspect about general relativity... the nonpreservation of direction in a curved space. ...[He] decided to consider the possibility that length was also not preserved. ...To effect this change mathematically, Weyl had to make a slight modification in the structure of general relativity. He assumed that in addition to the usual metric (set of numbers or variables) that described the gravitational field, there was another one related to length. ...amazingly when the result was analyzed Maxwell's equations mysteriously appeared. It almost seemed as if a bit of magic had occurred and scientists quickly became interested in the miracle. ...but with detailed analysis the theory was shown to be flawed. Einstein was the first to put his finger on the flaw. ...Weyl soon acknowledged the flaw and laid his theory to rest. It may have been a failure (actually it was not an entire failure; a similar idea is used today in modern field theory), but it did accomplish something important: it got people interested in the possibility that the electromagnetic and gravitational field could be unified. Einstein soon began working on an alternative theory, as did others. He realized that formal mathematics might even have an advantage over immediately insightful ("phenomenological") mathematics, because in its conceptual constitution it was free from the restrictions of the latter. I will call this view the symbolic realism of the "mature" Weyl. This page was last edited on 26 February 2019, at 19:00.